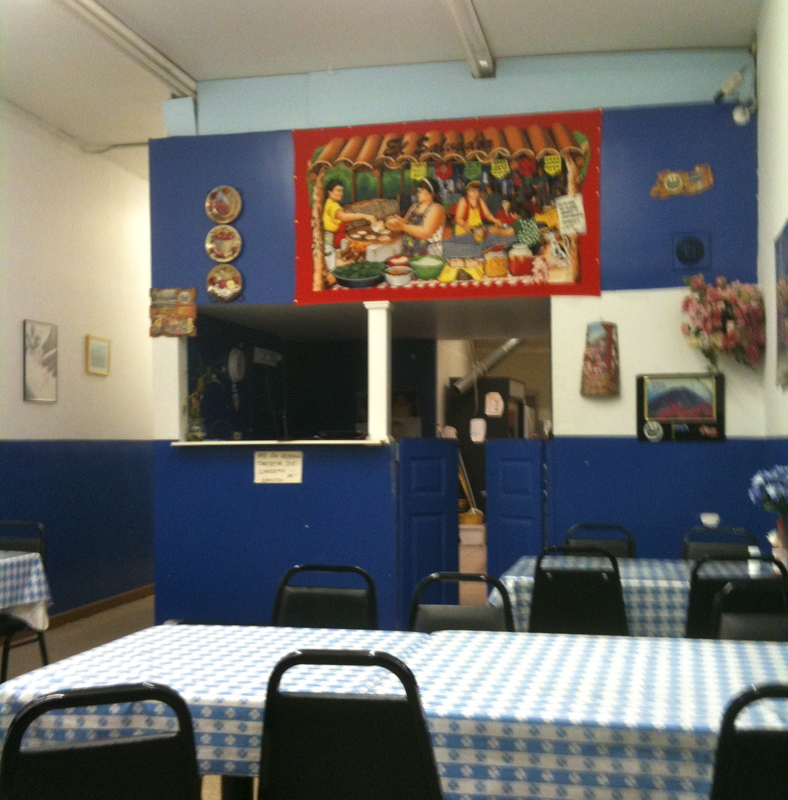 As far as I know the Restaurante Savladoreno (or Cafeteria Salvadorian) is the only Salvadoran restaurant in Columbus. It is located near the Port of Columbus airport on the same street (3208 Allegheny Drive) as El Tacorriendo. Located in an otherwise deserted strip mall it is the only beacon of light in a very dark parking lot. The interior is basic but cheerful and the walls and menus are decorated with maps and photos of El Salvador. The restaurant seems to do a good take out business. We had come across pupusas the national dish of El Salvador during our taco truck research as they are served at Mr Grill Tacos and were a feature of the short lived Pupuseria y taqueria Usuluteca. 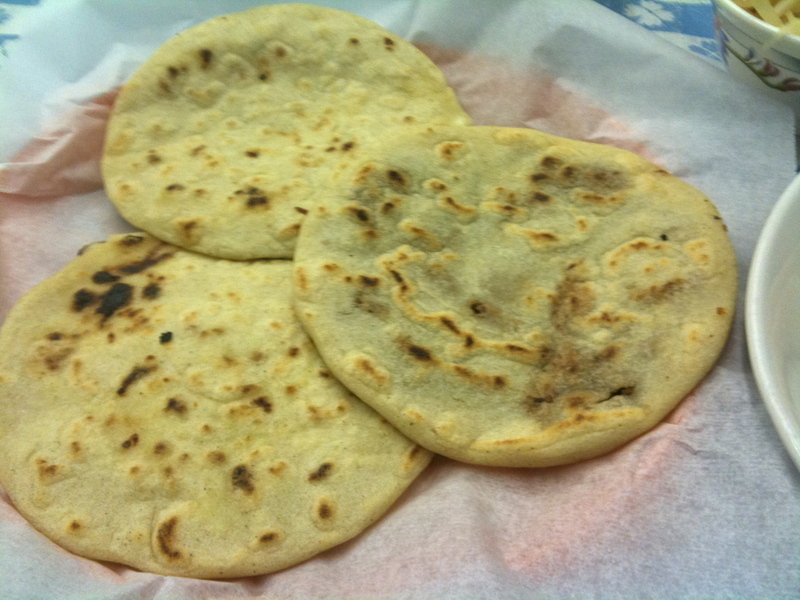 When we heard about a pupusa restaurant we were intrigued to experience more Salvadoran food. Pupusas are a thick corn griddle cake stuffed with a filling such as cheese, refried beans or chicharron (pork rinds). Our favorite of the three we tried was cheese with loroco (an edible flower). The pupusas were thinner and more delicate than the ones we have had at taco trucks and not at all greasy. They are served with a dish of curtido – a cabbage salad that is pickled and a little spicy, the salvadoran version of sauerkraut. You can see it in the top left corner of the photo below. We tried a tamale and tamilito. Salvadoran tamales are wrapped in a banana leaf instead of the corn husks that are used in Mexican cuisine. This tamale contained chicken (with bones) in sauce and the corn meal was moist but dense. It was similar to the Colombian tamale that we tried at El Manantial. The tamalito was like a corn bread, very light and airy but much drier than the tamale. It was served with Salvadoran crema which is similar to sour cream but milder. 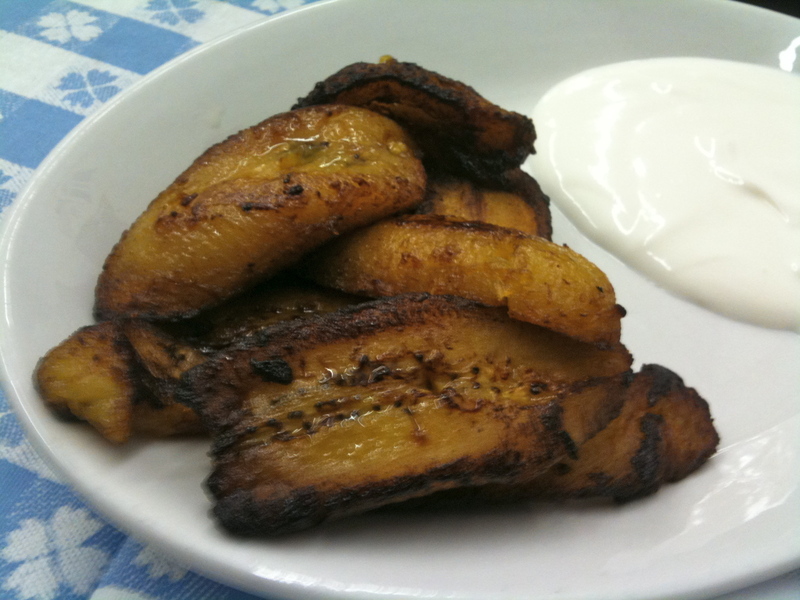 Next were the platanos fritos, ripe fried plantains also served ‘con crema’. The plantains were beautifully caramelized and one of the high points of the meal. We chose two main dishes from a long list which consisted mainly of variations of beef and chicken. There was at least one pork dish and a few of seafood dishes, including grilled fish and shrimp. 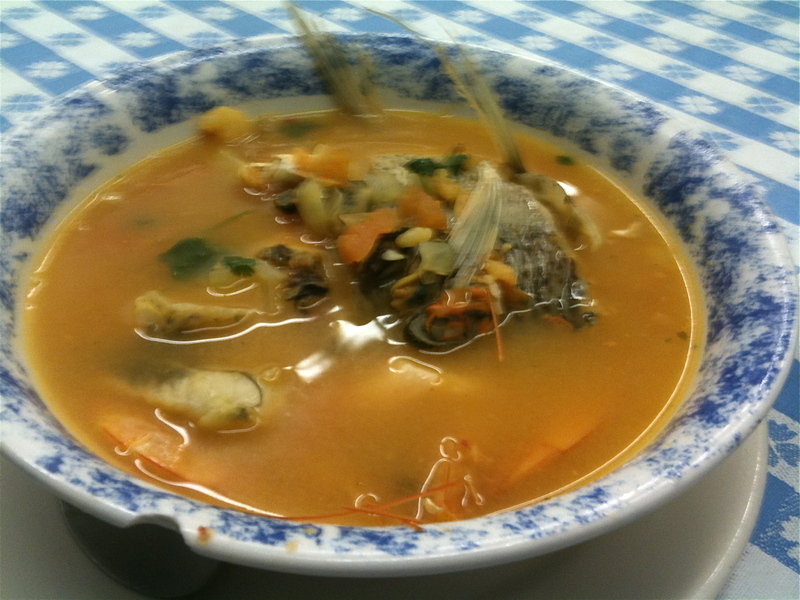 There are also a few soups (sopas) and we tried the sopa de mariscos which had a rich fishy broth and pieces of fish, shrimp and shellfish. There were a lot of bones in the soup so eating it required attention but the broth was very flavorful. 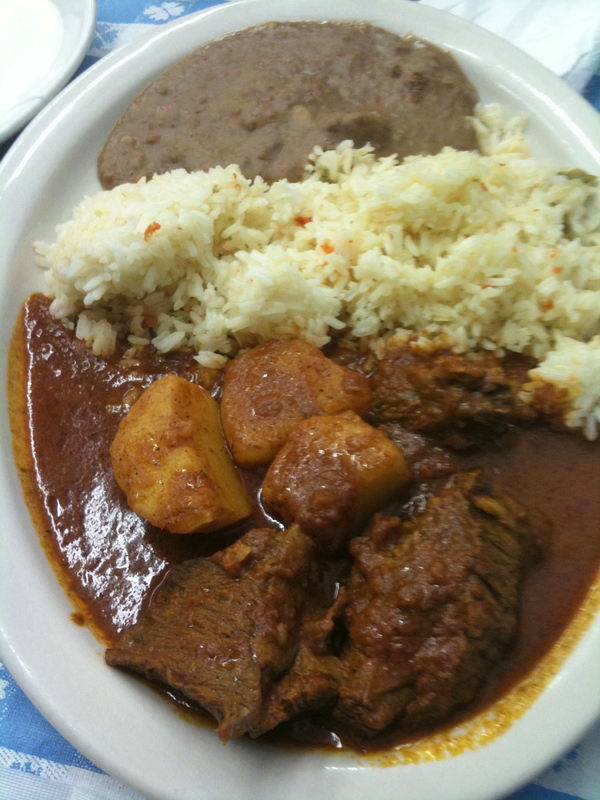 Our other main was carne guisada, a rich beef stew served with potatoes, rice and refried beans. The beef was very tender and I thought the sauce was really tasty. We were also given a plate of Salvadoran tortillas which are thicker corn tortillas and I’m not sure which dish they were supposed to accompany but they were perfect for dipping into the beef stew. The menu has very little description of the dishes so I think there is plenty more to discover. I already have a list of other dishes I would like to try including the pollo encebollado (chicken with onions) and the pupusa with chicharron. I am also tempted by their breakfast dishes. Salvadoran food seems to be less spicy than Mexican cuisine with mild, sweet flavors and is therefore a good option for those who don’t like too much heat. The Restaurante Salvadoreno is a no-frills destination with house made food, it’s a good place to head to when the weather is too cold for taco trucking. The Restaurant is open 10am-8pm except Tuesday. It is cash only. Here are some references on Salvadoran Food: Whats4eats.com, Wikipedia.